Now, in 2006, it is easy to forget that the World Wide Web was starting up just ten years ago, in the mid-1990s. Ten years ago, we were seeing the very first websites — of organizations such as governments, businesses and universities, and of individuals. Websites that were brand new in the mid-1990s, the Early Days, are now celebrating their tenth anniversaries. Fourteen weeks ago, on January 15, 2006, Transport Canada celebrated its 10th year on the web. This celebration webpage includes screenshots of archived copies of the website in its early days, including one showing its appearance in August 1997 (displayed in the Microsoft Internet Explorer browser, which did not exist at that time). 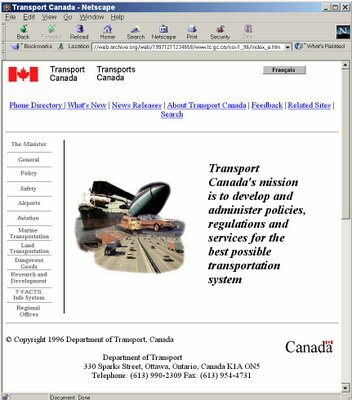 Here's the appearance of the Transport Canada website in November 1996, as displayed in Netscape, the dominant browser of that time. 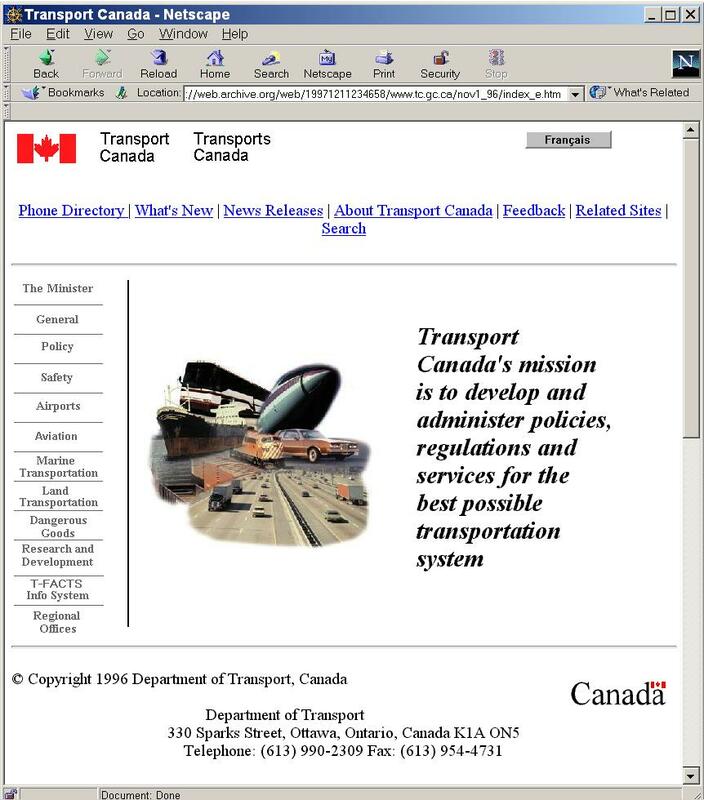 The Transport Canada website in the early days. This image was archived on December 11, 1997, but this design was online from November 1, 1996. For a full-size view, click on the image. "This site has been optimized for Netscape Navigator® version 2.0 or equivalent." "This site best viewed with Netscape version 2.0 or greater." "This page has been accessed 16,811 times since June 19, 1996." "This page is best-viewed with Netscape 2.0..."
The above are the dates on which the earliest known copies were archived, and are not the dates these websites first appeared online. "This site is best viewed using Netscape Navigator, which supports a large set of HTML extensions, some of which have been used in documents located here. Netscape browsers are available free of charge to students, staff, and faculty members of education institutions, charitable non-profit organizations, and public libraries."